For those of you that have been waiting to hear the new tournament date after the Mattagami First Nation Walleye Tournament was canceled on June 2nd & 3rd due to the forest fires up here, the new dates have been have confirmed. 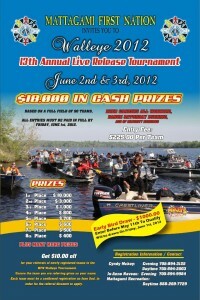 Cindy McKay informed me last night that the commitee has rescheduled the tournament for September 8th & 9th. This should be a great tournament as this lake has never held a tournament in early fall before. Should prove to be interesting in seeing how the anglers go about dissecting this water body at this time of the year. Look forward in seeing everyone there and if you haven't already entered the tournament and have some time off then, well maybe I will see you there also.